No commercially dyed yarn can re-create the deep, rich and visually pleasing colour effect of a hand-painted or hand-dyed yarn. While these unique properties of the handcrafted colours are what we look for, it is somehow tricky to work with the tone variations between skeins. There is one thing in common between all hand-dyed yarns: no two skeins are exactly same colour! 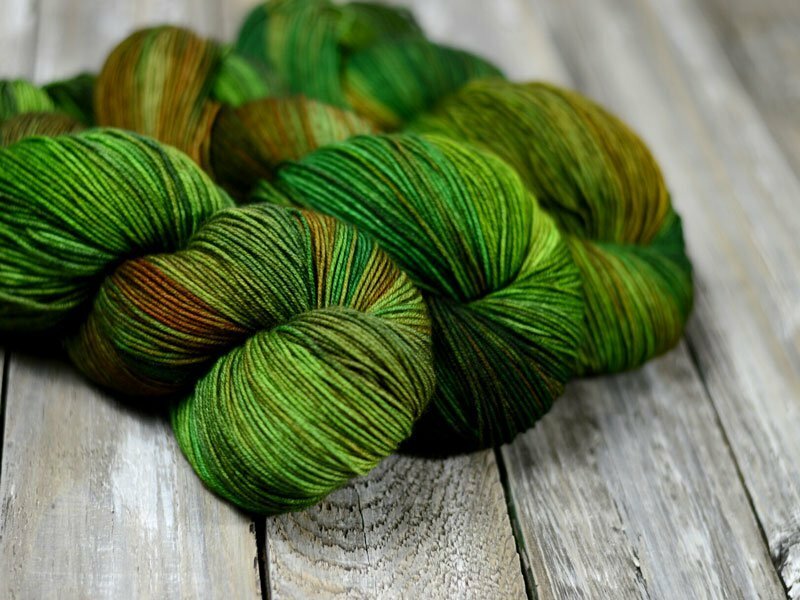 Saying that no matter if you bought the yarn at once, at the same store and examined the skeins in a good light, you may end up with a garment showing a clearly visible difference at the place you switched skeins. It is not an issue for one-skein projects, or you may not mind it and enjoy it the way it is. However, if you are knitting a larger project like a sweater, visible colour changes may turn later in frustration and disappointment. Examine your skeins and arrange them from lightest to darkest. Let say we have 5 skeins, no.1 will be our lightest one and no.5 the darkest. It helps us avoid working the two most contrasting one after another. Useful tips* When we describe a colour as “light” or “dark”, we are talking about its value. A simple trick is to take a black&white picture of the skeins (you can use your phone camera). Because “value” is related to how close to white is the colour, on a B&W picture the value variations will pop-up. 2. Use your skeins strategically! The worst thing is to switch skeins in the middle of a visual center of the garment panel (chest, sleeve, back). Human eyes are excellent at detecting light differences when they are adjacent. On the other hand, our brain subconsciously deconstructs a garment on its main pieces as a front, back and sleeves and tolerates shifts of light between those parts. If your yarn for the project has an insignificant colour difference between skeins, separate the most visible variations between the front and the back of the sweater. In our 5 balls example knit no.1 and no.2 for the front and no.4 and no.5 for the back and use the leftovers plus no.3 for the sleeves. 3.Change balls at a natural break in the pattern. A workaround for a slight difference is to switch balls when your pattern changes. If your garment starts with ribbing, then stockinet, then lace panel, swap your balls at the break point of these stitches. Another good solution is to introduce your new ball of yarn gradually by knitting about 10 stripes of alternation between the old one and the new one. This is a great short-cut technic for minor variations between skeins. 4.Alternating skeins – better safe than sorry. We have this advice printed on our labels for a reason. To alternate skeins means to work two balls of yarn simultaneously by switching them every row when knitting in the round, or every second row if worked flat. This will blend the two skeins together, and the difference between the two wouldn’t be clearly noticeable. Keep in mind your “value” order of the skeins (see p.1) when alternating. Back to our 5 skeins example, DO NOT alternate in sequence no.1 with no.2 and so on or the lightest with the darkest no.1 with no.5. Try to blend every other i.e. no.3 with no.5. Garments knit with hand-dyed yarn are precious pieces of work, they are also an investment of both time and money, and we must make at least some effort to be satisfied with the result. Planning our handwork helps keep the colours consistent across the entire project, which will make us happier in the long run. It may sound overwhelming and annoying, but you’ll be surprised by how simple it is once it becomes a habit. Posted in Useful information. Bookmark the permalink.